This is the second half of the Summary Of Proposals For The Permanent Medallion Sales Program. Like in the first article, the proposals are listed randomly, in no order of preference. Ed Healy's proposal contains six key recommendations. Here they are as they're worded in the proposal, with some comments in parentheses and italics. Healy's proposal is published on his blog, “The Phantom Cab Driver Phites Back”. CLICK HERE to read the full proposal. I have covered what I hope are the main points in the SFCDA proposal. The City should eliminate the “SFMTA Direct Sales To Buyers” aspect from permanent medallion sales: In other words, the SFMTA should no longer sell medallions directly to buyers, and then receive the full $250,000 from each medallion. Under a permanent medallion sales program, sales should be restricted to driver to driver sales only, with the City taking just a cut from each sale, but not the full price. The idea is that since in, “SFMTA Direct Sales To Buyer” transfers, the SFMTA gets all $250,000 per medallion (minus 5% to the Drivers' Fund), and that this could lead to a conflict of interests. That's because budget deficit needs could influence the MTA to issue new medallions based on need for revenue instead of transportation. It could also influence the number of medallions that could be newly issued. The idea to eliminate “SFMTA Direct Sales To Buyer” was recommended to the MTA by the Taxi Advisory Council in a motion passed June of 2011. Allow medallion holders ages 55 and above to buy out of the driving requirement, as an option to selling: This would allow medallion holders who reach the age of 55 to reduce their driving requirement from 800 hours per year to 600. That's providing the holder agrees to pay $100 per month, or $1200 per year, to be split between the SFMTA and the Drivers' Fund. Drivers aged 60 could have their hours reduced to 400 hours per year at a rate of $200 per month, or $2400 per year. And drivers aged 65 or disabled, could have their driving requirements eliminated completely, providing they pay $400 per month, or $4800 per year, to be split between the SFMTA and the Drivers' Fund. The SFCDA adds, “To allow for inflation and market changes, these payments could also be set at a comparable percentage to medallion income instead of dollar figure.” Under this option, drivers would keep their medallions for life. When the medallion holders dies, their medallion would go back to the list as an earned medallion. SFCDA argues its plan would support the “gate and gas” structure, and “provide more available shifts for non-medallion holding drivers.” This is because medallion holders aged 55 or older, who choose the reduced driving requirement option, would have to operate their medallions as gate and gas. This would open up more shifts for non-medallion drivers. Additionally, if the City were to no longer issue, "SFMTA Direct Sales to Buyers" transfers, then new medallions, or revoked medallions, would be issued as earned medallions to the waiting list. There's more to the SFCDA proposal. It is available online. CLICK HERE to view it in full. Mark Gruberg's proposal is laid out in a series of questions that stakeholders must consider. He then offers his own responses. Should medallions continue to be sold under the new system? Gruberg's view -'No'. But the assumption is that they will be part of a permanent medallion structure anyway. Assuming medallions are to be sold, should the sales price remain fixed, or should they be sold at market value? Gruberg's view - “they should remain fixed”. Assuming a fixed medallion sales price, what should that price be? Gruberg's view - $250,000 is a fair fixed rate. Prop K medallion holders did not financially invest in their medallion and have already received monthly income for a number of years. Therefore, any amount of money gained through sales is a windfall profit, so medallions should remain affordable for the next buyer in line. Should medallions be issued exclusively to qualified cab drivers? Gruberg's view – Yes, and it should come with a driving requirement. Medallions should not go to cab companies or other non-driving persons. Should a certain number or percentage of medallions remain non-transferable and be permanently reserved for issuance to qualified drivers? Gruberg's view – Yes. Not all deserving drivers are in a position to purchase due to lack of finances, age, or both. There's more to Gruberg's proposal. It is online. CLICK HERE to read it in full. Ruach Graffis' proposal is by far the longest and most complex of the proposals. While Luxor Cab's may try to win favor by its simplicity, Ruach's is complex, appeals to human conscience, and is titled, “Service AND Fairness”. Hers is eleven pages long. The proposal is unique in that it calls for drastically altering the structure of the taxi industry over time, slowly converting Pre K medallions into single operator medallions, allowing ramp medallions to become corporately owned with employee drivers. And, finally, calls to end the selling of medallions completely. She articulates the importance that taxis play in major cities everywhere, and therefore stresses the importance that taxi drivers be guaranteed adequate quality of life for the jobs they perform. It is hard to make a checklist of all the key issues raised in Ruach's proposal, because there are many. Here are what I feel are the main ones. 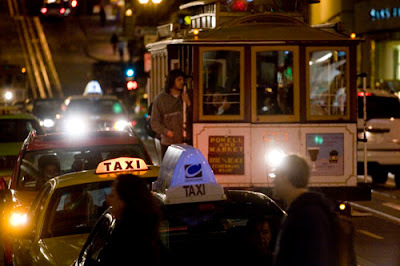 San Francisco's taxi industry is often overlooked as an “after thought”, or a “cash cow” that benefits other public transit systems, such as for budget deficits, even though the industry itself is not municipalized. Taxi workers deserve more respect than this from authorities if authorities want “world class” taxi service. The “cyclical nature” of the taxi industry is “the first of the industry problems”. In other words, it's very busy sometimes (e.g., Friday nights, Bay to Breakers, etc. ), and other times it's very slow (e.g., late Tuesday nights in winter, etc.). Allowing illegal taxis is an inadequate approach for solving it. The proposal calls for more driver owned taxi service that could be more responsive to shifting demands. The meanings and concepts of Pre K, Prop K, and Prop A medallions should be lumped into a new category simply referred to as “Master Medallions”. They would be the bulk of the industry and operate according to the current leasing structure and gate cap. But the proposal calls for the expansion of Single Operator medallions by converting Pre K medallions to Single Operator. In other words, once the Pre K owner dies, the Pre K medallion would be brought back to the City and re-issued as a total of three, separate Single Operator medallions for every one Pre K turned in. But while the Pre K owner is living, the medallion would operate as a Master Medallion. All taxis drivers would pitch into the Drivers' Fund at various rates depending upon hierarchy, to build healthcare and retirement money. For example, entry level gate and gas drivers could pay $5 per shift, Single Operators $300 per month, Prop K holders $400 per month, and Pre K holders $500 per month. Drivers would become qualified recipients after having fulfilled a designated number of years worth of service to the industry. There is more to Ruach's proposal. And her proposal is available online. CLICK HERE to read the full text. This ends the general summary. I hope I did a decent job... a worthy attempt. I apologize in advance to anyone who may feel I overlooked an issue. Still to come before the January 30th Taxi Advisory Council meeting, the most difficult but important part - highlighting the obvious similarities and differences.